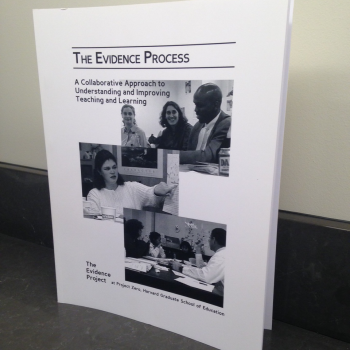 The Evidence Process: A Collaborative Approach to Understanding and Improving Teaching and Learning, 2001. A handbook for administrators, staff developers, and teachers interested in, or already involved in, looking at student work collaboratively with colleagues. It describes and provides resources for an inquiry process developed by Project Zero working with public elementary and middle schools in Massachusetts.